Her eyes are so amazing. Normally brown eyes are just a bit dull, but her eyes are not dull at all! So incredible. Wish my brown eyes sparkled like hers. Maybe it’s because they’re hazel brown? I always thought hazel eyes were a combination of blue-green, but apparently any combination of two color tones is considered hazel, even though for them to be “officially designated” as hazel, the polychromic features have to dominate… in other words, the two colors have to be visible together at all times. I found that out when I got curious about possible reasons why I’ve been told most of my life that my eyes “change colors” by strangers and family alike: my eyes look golden and even partly green sometimes (I joke that my irises get greener from lack of sleep). Other times they’re pretty brown looking. It’s a trait I inherited from my dad, who was always told the same thing about “changeling eyes”. His own dad had green eyes, so perhaps that’s my granddad’s genes’ way to stubbornly stick around in spite of all the brown eyes that try to water it down? My daughter’s eyes are hazel too, but hers are a combination of my gold undertones and some gray ones, which I’m told do run in her dad’s family. Again, depending on how the light hits them, her eyes look either golden brown, or gray. Since she’s still growing, it’s still up in the air which color will eventually dominate as a feature, though. Personally, I’m hoping for gray to win out, though. “this is great, Mama” She is a little smarty pants! I love when you write about your conversations with her! It makes me smile every time! Usually Annie looks just like Mike, but there is something in her expression in this picture that looks just like Heather. Maybe it’s the “farkle” :). So beautiful! I absolutely ADORE Annabel’s eyes – they are GORGEOUS and suit her to a beautiful “T”!!! A farkle here, a farkle there, let them sparkle, sparkle, everywhere! You have such a beautiful and enchanting family! 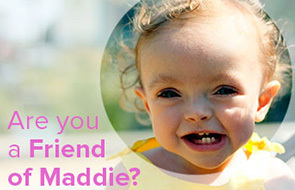 Yes, just like Maddie, Annie has amazing depth to her eyes. Also, my girls have a few “farkles.” We name them. You should have her name hers. It’s pretty funny what they come up with. We name my daughter’s ‘farkles’ too…my two favorites are “Mark” and “Dot”. She is such a little beauty!